User research is necessary for any product to evolve. Simplify the process and optimize its impact with our user research template. What is the main focus of this session (e.g., general performance, feature requests, product bugs)? Relevant user information and demographics to understand the persona of the interviewee. List all planned questions for this particular user research study. Record the interviewee's response to each question. Did the user mention any specific positive aspects in relation to the topic of this session? Did the user mention any specific negative aspects in relation to the topic of this session? How could we improve them? Did the user provide notable feedback outside the scope of this session that could help other business objectives? Summarize the key insights that you learned from this user research session. 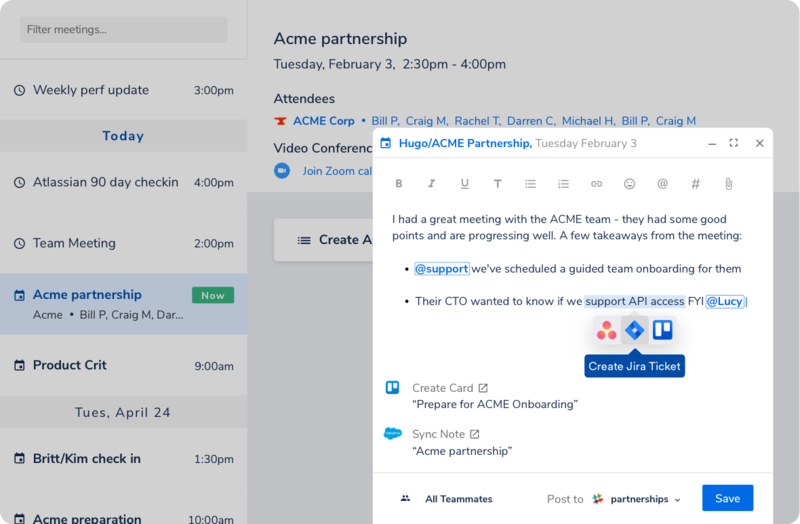 If any are actionable, you can assign them to your team members right from here. Were there any notes, quotes, or anecdotes that may assist marketing in their messaging to other users? User research is an art and a science. Transforming qualitative insights into quantifiable trends that ultimately become design, engineering, and product outputs is easier said than done. But it's an essential step for any product organization to grow and evolve. Ensure you build the right product for your users with this simple yet dynamic user research template. Effective user research sessions all start with effective note-taking. Through versatility, sharing, and action, our meeting note template can maximize your return on investment from user research. Typical user research templates are constraining, making it difficult to gather relevant information. This outline is flexible and open-ended so you can customize it to capture a variety of data. Whether you want to focus on design or you're trying to refine your features, simply tailor this user research template to suit your needs. You can then share your insights with team members who weren't there. User research notes often end up siloed off, only to be seen by one or two team members. With centralization and sharing capabilities, your entire team can benefit from the unique insights of your users. This opens the opportunity for everyone to contribute improvements. Of course, information means nothing without implementation. You can optimize the impact of your gathered insights by turning them into actionable and assignable steps right from this user research template. In turn, this accelerates improvements and effective solutions. User research can be profound if you know how to understand and use it. This meeting note template streamlines the process so you can get back to building a better product faster.